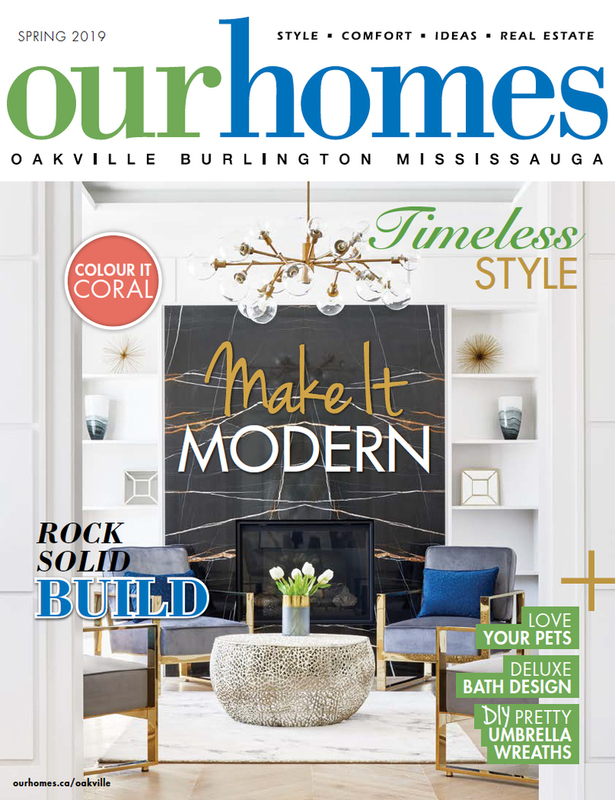 A version of this article originally appeared in the Spring 2019 issue of OUR HOMES Oakville Burlington Mississauga, p.48. Find local businesses in our Oakville directory. 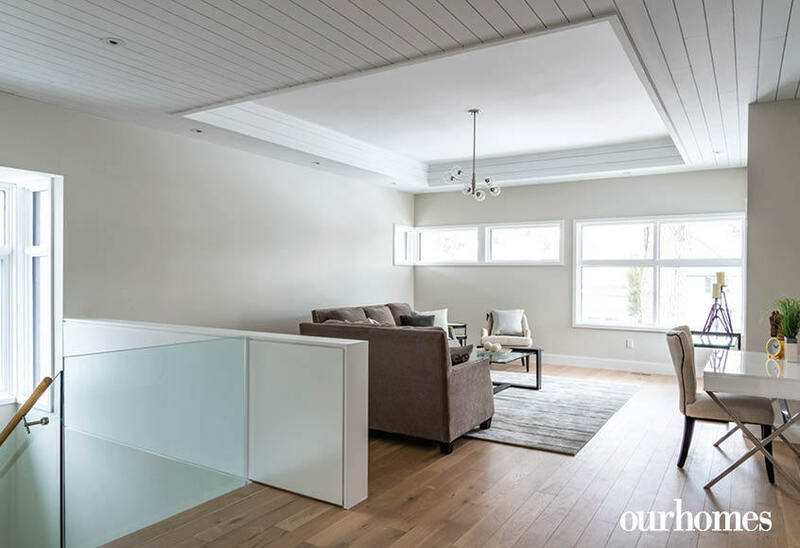 A recent Port Credit project by David Small of David Small Designs and builders Profile Custom Homes illustrates how a modern build can successfully connect to an older lakeside neighbourhood. 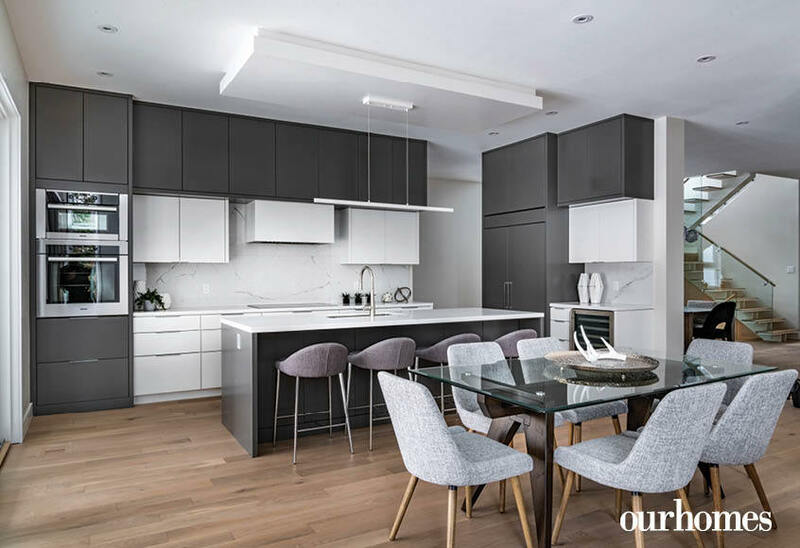 “It was exciting to take all the modern, super-functional approaches to a 50 ft. lot in one of the best neighbourhoods in Mississauga and see what we could do with it,” says David. 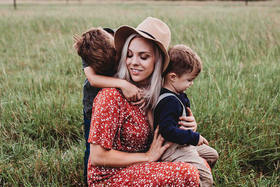 With most of the lots in the area valued at $1.3 million, zoning for the property allowed the home on this lot to be pulled forward to achieve modest lake views. To pull things forward, the design incorporates L-shaped corners to achieve the coveted lake views. “The key attribute in this neighbourhood is the lake, and almost no one gets a lake view,” says David. The L-shape created the perfect alcove for the home office, with floor-to-ceiling windows and a view to the water. 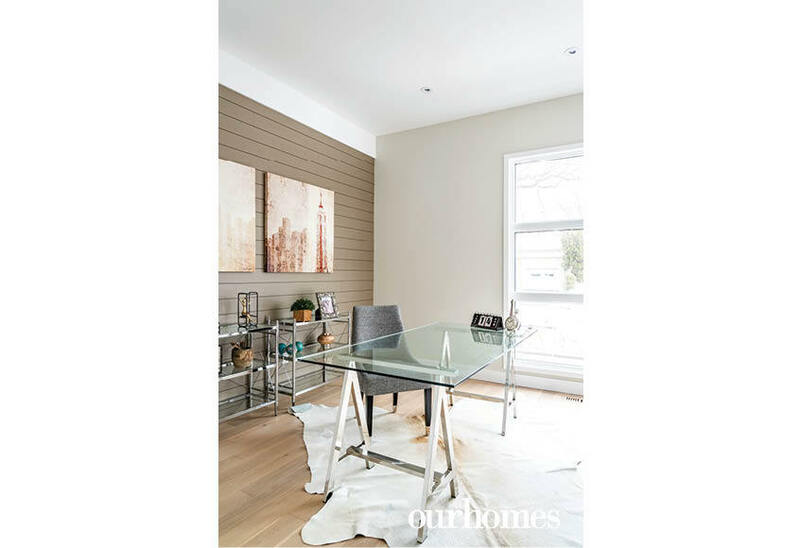 Siding used on the exterior is incorporated in a feature wall to blur the boundaries between indoors and out. 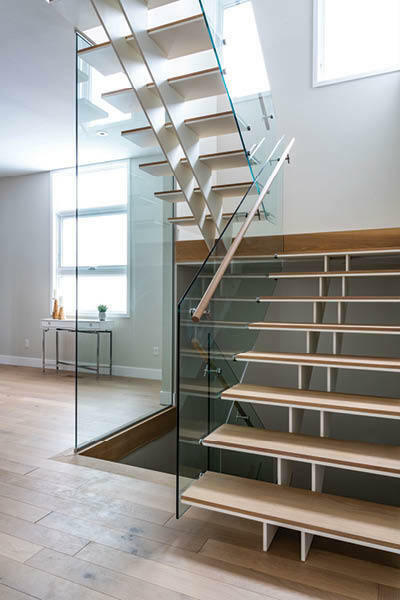 The staircase is a focal point, with glass panels and cantilevered stairs that seem to float upward. 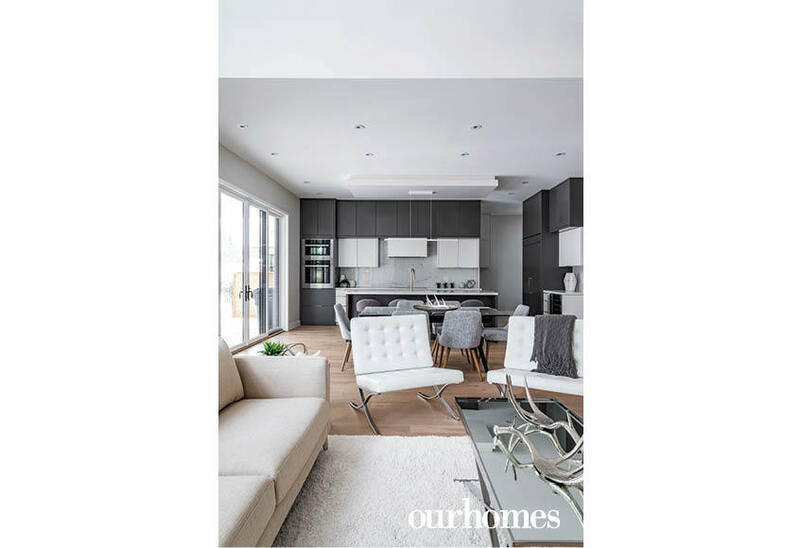 The back of the home features an open-concept great room, kitchen and dining area. 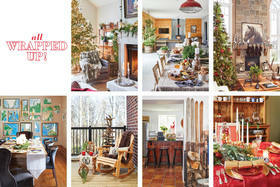 At 14 feet, the great room’s corner windows emphasize the height. 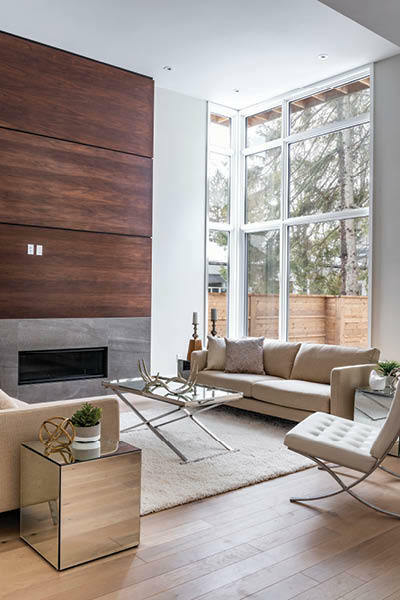 A linear fireplace is complemented by a floor-to-ceiling walnut surround to add warmth and anchor the room to similar elements throughout. Different ceiling treatments help delineate each individual space. Double glass sliding doors by the eat-in dining area look out onto the covered back porch, a space that can accommodate dining, lounging and barbecues. 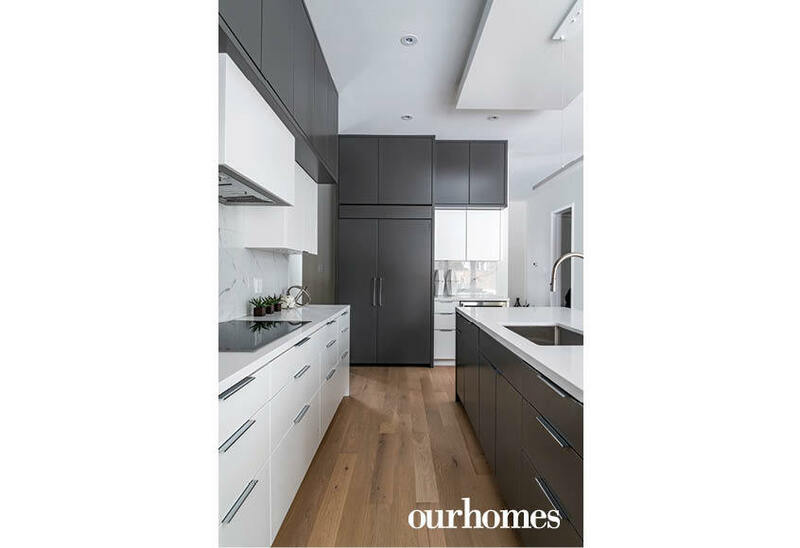 The spacious kitchen is clean and minimalist with sleek, white lower cabinetry and dark upper cabinets for contrast. Upstairs, the large family room with plenty of windows offers optimal views. A trey ceiling with shiplap treatment is a subtle nod to a nautical theme. 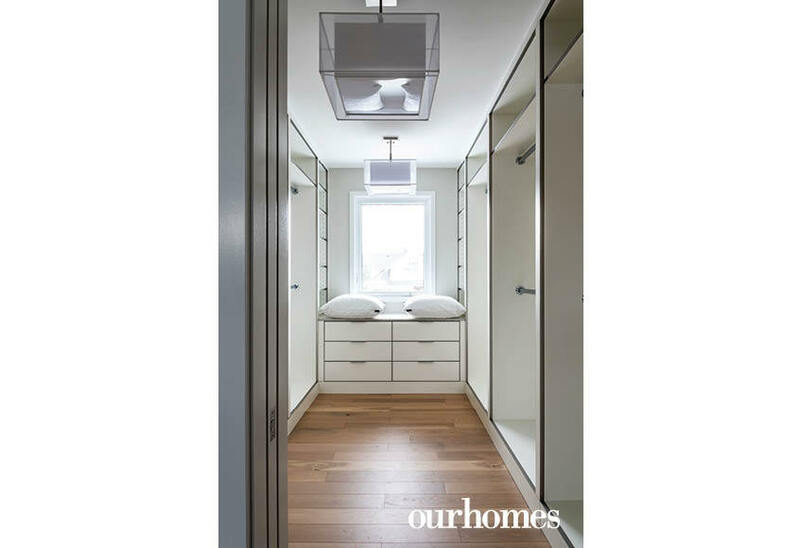 A pocket door separates the common area and the bedrooms, providing privacy and defining the family room as an extension of other living spaces in the home. In the master, a modern, floating bed was crafted from the same walnut as the fireplace surround. The shiplap ceiling treatment maintains the indoor-outdoor flavour. 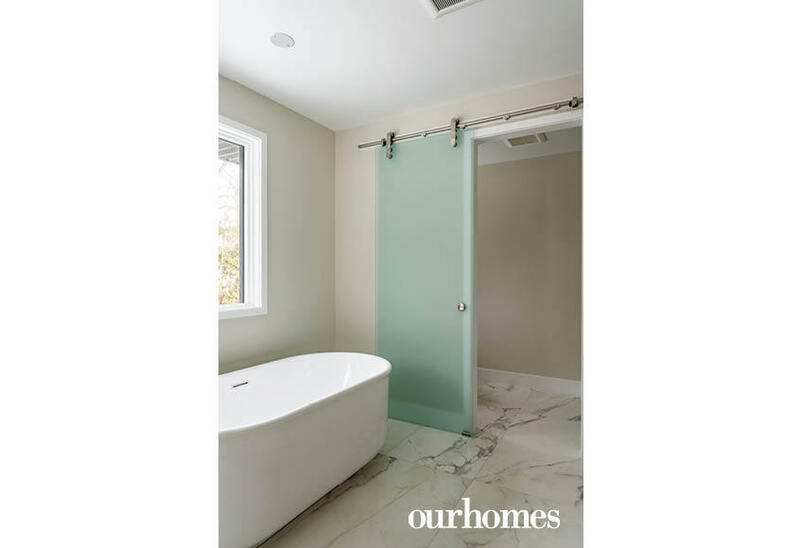 In the en suite a sliding frosted glass door separates the commode and shower area and lends a spa-like feel. James Hodgins, founder of boutique realty company Hodgins Realty Group Inc., Brokerage, compares owning this original David Small collection home to owning a fine piece of art. “The creative design genius of David Small has become recognized as a monetized luxury brand. 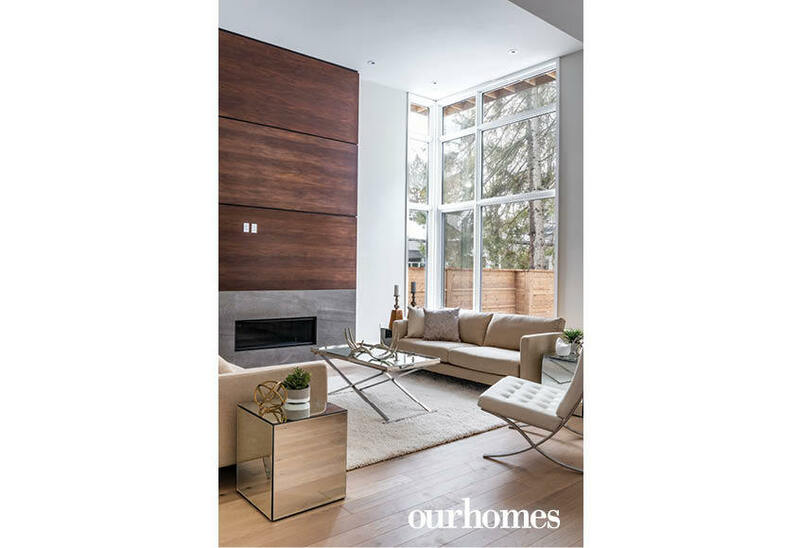 Whoever most fortunately buys this home will enjoy the double benefit of owning not only their lifestyle dream home but also the first publicly offered ‘proof of concept’ David Small original design/build,” says James. 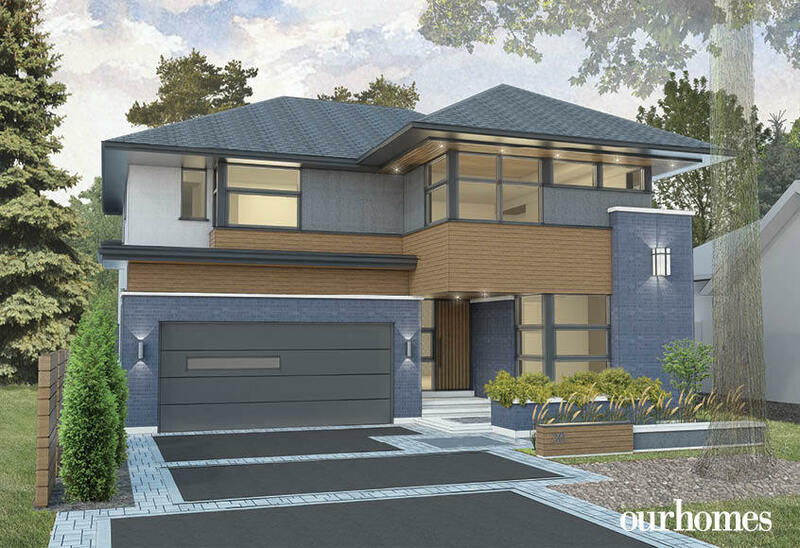 In this rendering, the exterior materials were thoughtfully selected to anchor the home to its surroundings. Oversize windows bring the outdoors in. The great room and kitchen function as one big living space. 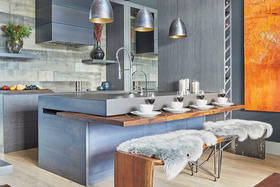 The modern, streamlined kitchen brims with amenities. Simple white counters and backsplash maintain the clean, crisp feel. Simple but effective, appliances are integrated to maintain the clean look. A servery just off the kitchen blends seamlessly with adjoining areas. 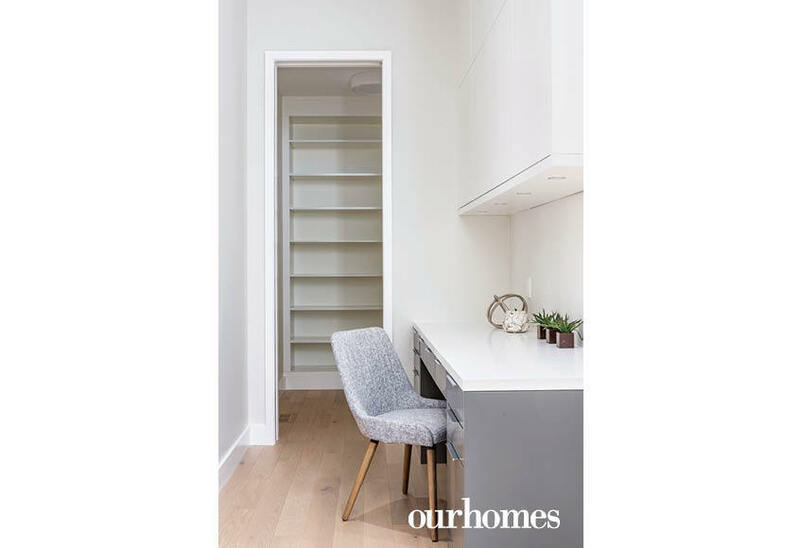 A nook with an integrated desk creates a multifunctional space that can be used for writing or a place to stack dishes on the way to the dining room. 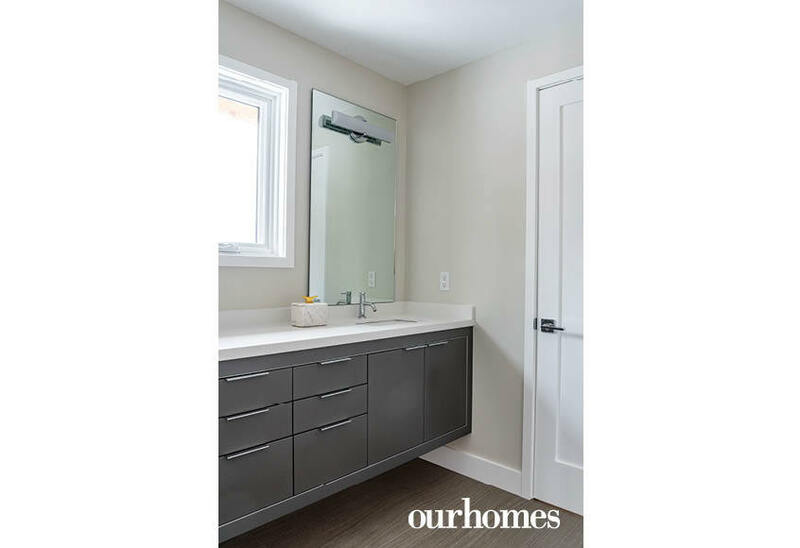 The long mudroom with access to the garage was thoughtfully laid out, with cubbies and storage to the left of the door, helping to contain the mess of daily living. 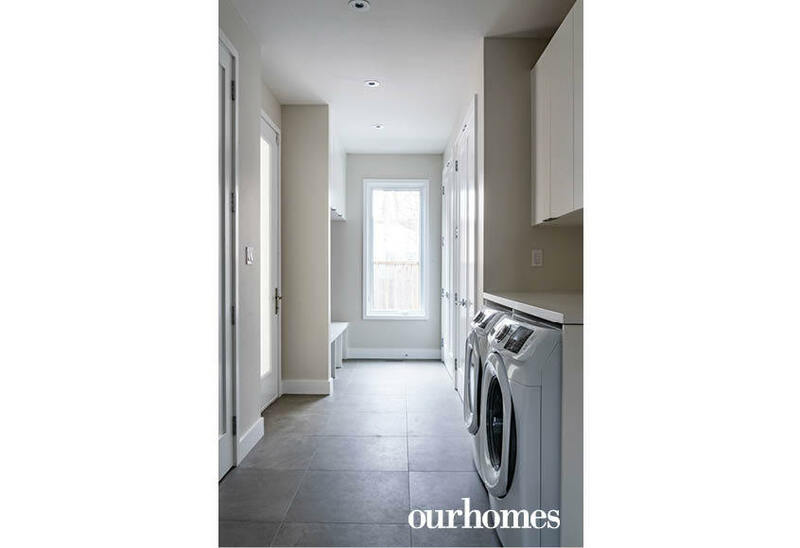 Addional closets and laundry facilities were placed closer to the door to the home’s living area. The upper level family room extends the main-floor living space. 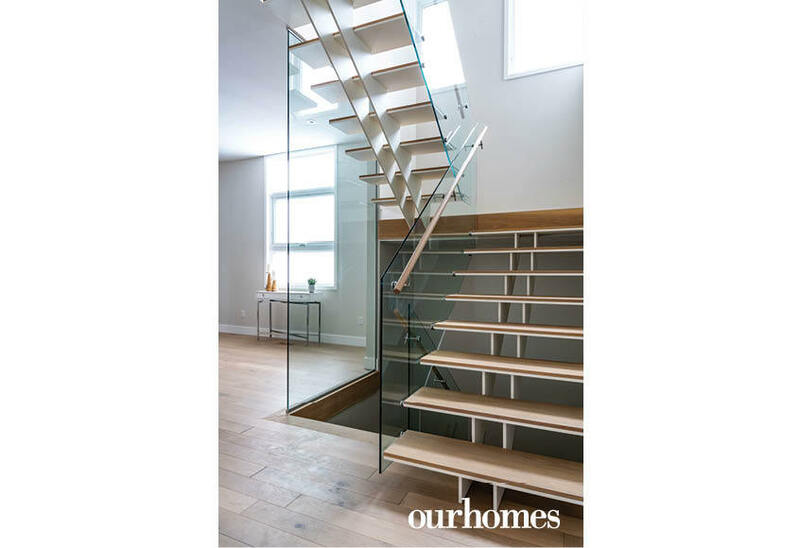 The open staircase is a dramatic focal point. The dining room is centrally located on the main floor. A Jack-and-Jill bath connects two of the upper level bedrooms. Warm walnut on the ceiling and platform bed helps blur the lines between indoors and out. 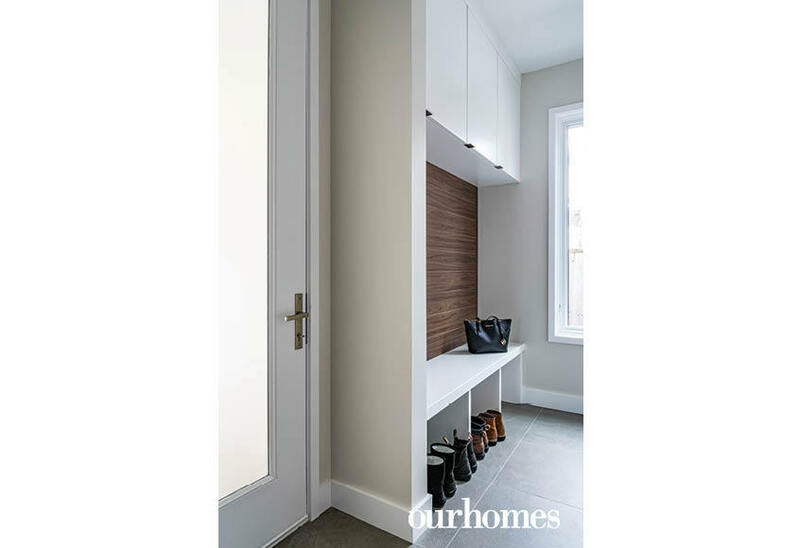 All the closets in the home are outfitted with beautiful built-ins. 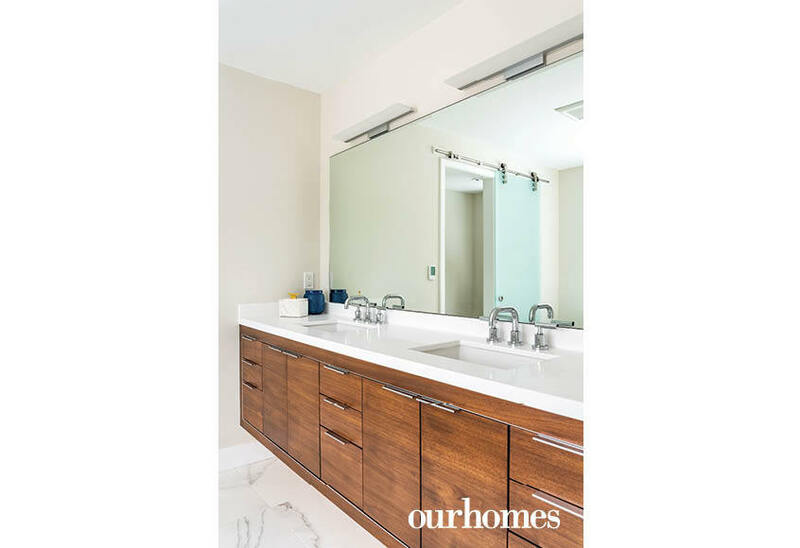 The wood vanity adds warmth to the fresh, spa-like en suite. A frosted glass door to the water closet slides closed for privacy.